Microneedling is performed by rubbing a device covered with hundreds of tiny needles over the skin causing small wounds in the outermost layers of the dermis. These microchannels stimulate the body to produce collagen, the protein that gives the skin its elasticity, and also allow serums and other topical products to be better absorbed. The concept fascinates me, but my feeling before I started researching at-home microneedling was that the rewards aren’t worth the risk. New York City-based cosmetic dermatologist Dr. Marina Peredo agrees. While Peredo is wary of cheap, at-home microneedling devices, she does see benefits in the treatment when it’s performed by experts. At her busy practice in Upper East Side Manhattan, she often combines platelet-rich plasma (PRP) facials — also known as vampire facials — with microneedling to promote healing and help the growth factors penetrate deeper into the skin. “We mainly do microneedling on younger patients who are interested in less invasive procedures to address acne scarring. It helps smooth the skin’s texture, while reducing the appearance of large pores,” says Peredo. The key difference between a do-it-yourself microneedling kit and the medical grade devices that professionals use: home devices are not as invasive, and have much smaller needles than those used in a dermatologist or plastic surgeon’s office. One minute each night is all you need ?!! Check out what my friend Kristi (yep- I know her ?) had to say about using Redefine + Amp MD System for 3 months: “Okay…. I am very nervous to put this out here… But here is my three month results using Rodan and Fields AMP MD roller and intensive renewing serum. Nobody wants to bring scrutiny to their flaws but I obviously have some bad acne scarring. And yes, I still have a ways to go but you guys! This is THREE MONTHS! ? I am loving the changes I see in my skin!” Can’t wait to see her skin in another 3 months! Make sure you are using disposable needles. Sterilize your device with rubbing alcohol before storing it in its case. If you can’t keep the device clean, toss it and get a new one. If you suffer from cold sores, makes sure you medicate properly. If you have skin lesions, don’t use an at-home device. Before buying a device, check consumer reports to see if it got bad reviews. If it gets invasive, stop. Most at-home devices should not draw blood, which can cause scarring. California-based Amanda Kass has sensitive skin and uses the GloPro (reviewed below). Dancyger says the logic behind the device seems sound, so she won’t give up just yet. “One thing that makes it difficult is that I’ve found you can’t really wear makeup for 24 hours afterward, or it stings. So, I only do it when I don’t have to leave the house the next day.” She seconds Kass’ opinion that it feels like using a very abrasive scrub. When microneedling isn’t done right, there’s a real risk that it may cause skin damage. In this video, aesthetician Kerry Benjamin of Stacked Skincare in Los Angeles explains the proper technique. According to Benjamin, you should apply serum 3-5 times a week, then roll vertically, horizontally, and diagonally over your face for no more than two minutes. On her website she advises using needle sizes of no more than .30 mm. Here are four of the most popular devices out there. With professional microneedling treatments often priced at over $250, you really can’t beat the low cost of an at-home roller. Still, use your best judgment, and keep Peredo’s advice in mind — don’t go overboard. Skincare expert and aesthetician Kerry Benjamin launched her product line in 2014 to provide an at-home variation of her custom treatments. 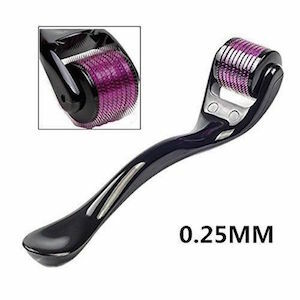 Users love the Micro-Roller’s 0.20 mm needles, and say that it helps with acne scars, smoothing the complexion, and reducing large pores. One drawback is that the entire roller needs to be replaced on a monthly basis — unfortunately, you can’t just change out the needle portion. You can’t beat the price. Healthy Care’s roller delivers, and has very small needles so you are less likely to damage the skin. Some people also prefer their rollers a bit larger, and this one is very small. If you are in a rush, you might not want to wait the three to six weeks for shipping that product requires. 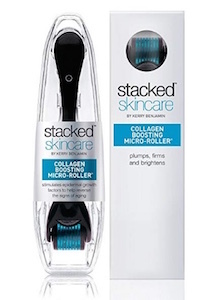 This trusted brand has an effective, but pricey, derma roller that can firm skin, and reducing lines with its micro-exfoliation roller technology. The Redefine Night Renewing serum is included in the system, which is an added bonus. Also, the company specifies that they use micro-exfoliating tips, which are not needles, for those who are purists. The kit comes with a clear storage case and a cleansing vial. The RegenaGlow Derma Roller is a complete microneedling package that includes an organic cotton carrying bag, a storage case, a cleaning cup, and a serum bottle. An e-manual rounds out the bundle, providing tips and tricks for optimal roller use. The roller’s 540 titanium needles are guaranteed not to break, bend, or dull. It also comes with a 60-day money-back guarantee. While there are many dermarollers on the market, few beat the ZGTS in terms of design. Its premium build marries a luxurious look with an ergonomic form for a great at-home microneedling experience. The ZGTS boasts a 192 titanium needle roller, with each needle coming in at a solid 0.25mm in length. 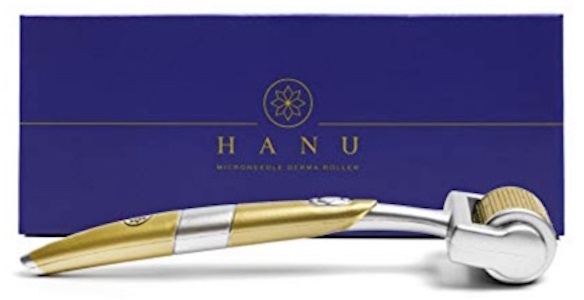 If you are looking to try it out, Hanu offers a 30 day money back guarantee to ensure satisfaction.